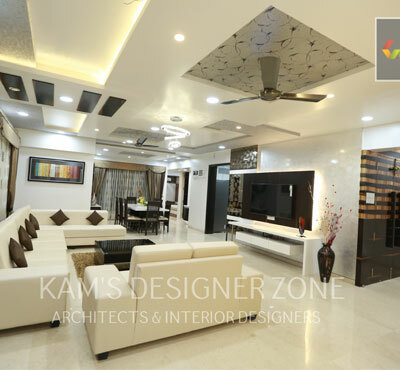 KAM’S DESIGNER ZONE is an Interior Design company headquartered at Pune established in the year of 2007 having professional practice in Interior Design, Architecture and Landscape Designing that offers turnkey project management and exclusive interior design services. We are a group of innovative minds eager to take creative challenges and providing wide range of design ideas for developing residential spaces in all over India. We approach each project with a holistic vision! We desire to create cost-effective designing wonders that are reflection of the people living in those spaces. We transform houses into warm & inviting beautiful homes. Our designs are ever evolving and inspiring. We strive towards excellence and becoming the top-most interior design company in the region. Our goal is to exceed customer expectations and keep building the portfolio of satisfied customers. Our team of expert designers is well-equipped to handle all kinds of projects and assignments. Kamal Joshi and Meenakshi Joshi, KAM’S DESIGNER ZONE founders, were graduates from a College of Architechure. Passion towards creativity and great design skills made them stepping into the world of interior design. Since 2007, they have made many homes beautiful and received accolades from thousands of their clients. Keeping client satisfaction as the most important parameter, KAM’S DESIGNER ZONE not only provide good designs but also helps client throughout execution process, right from vendor-material-contractors selection, and to save a lot of money by giving them complete control over the budget. Today KAM’S DESIGNER ZONE is one of the trusted interior design company in Pune and spreading across the the state Maharashtra. Their vision is to become one of the top interior design service provider of INDIA. We love what we do, and we want to help you do the same. We’re passionate about creating you a space that helps energise your staff and allows your whole organisation to work to its full potential. To guide you to the right decisions, we’re open in our approach. We’ll explain all the options, so you understand exactly what you’re buying and why, and how much it will cost. Our designers have the skill to define the best creative solutions for your interiors. But our creativity doesn’t stop there. Our whole team has the problem-solving ability to overcome challenges and keep your project on track. Your satisfaction is our priority. We work in close collaboration with you, taking care to listen and respond to your needs. We even assign you your own project manager to oversee fit out and furnish. Kams Design Zone has highly qualified interior designer and architectural who can offer consultation and advice. We are a team of highly qualified engineers, PhDs and dedicated technical professional who can offer you consultation and advice on any area, like IT home design, Flat design, office design and workshop design. Kams Interior designers work closely with architects, structural engineers, mechanical engineers, and builders to determine how interior spaces will function, look, and be furnished. Interior designers read blueprints and must be aware of building codes and inspection regulations. For more information on structural engineers, see the profile on civil engineers. For more information on builders, see the profile on construction laborers and helpers. Kams interior designers work full time. We may need to adjust our workday to suit their clients’ schedules and deadlines, meeting with clients during evening and weekend hours when necessary. Interior designers also travel to the clients’ design sites. Kam’s Designer Zone is a full service architectural firm in Pune offering each and every client, a combination of imaginative design, expertise, and intense involvement. Our reputation is based on providing the highest quality of professional services to every client. We produce work that is innovative, and practical, while keeping in mind the social, economic, environmental and aesthetic issues relevant to each project.